You can’t have helped but notice that 2014 is well under way! In actual fact, January is nearly over already. Time flies! With that in mind, I thought I ought to ‘dust down’ the CureSam blog, as I haven’t done much on here since last years fund raising efforts finished! I’m sure you were all glad to be left in peace for a while, but unfortunately, the time has come for me to raise my ugly mug once again and to start the ball rolling with this years fund raising efforts! As a recap, most of you will know, Samuel was diagnosed with Type 1 Diabetes in July 2010. Each year since then, I’ve entered some crazy challenge or other, to attempt to raise some awareness about this condition and to raise some money to try and find a cure! In Sep 2010, I cycled from London to Paris over a three day period and raised £2,346 for Diabetes UK. In 2012, we switched our focus to fundraising for JDRF (Juvenile Diabetes research Foundation), as they are more focused on finding a cure for Type 1 Diabetes. In September of that year, I entered the London Triathlon and we had a CureSam Rocks evening concert where we raised £1,791 for JDRF. Last year, I entered and completed the London Marathon – I still have the scars! (Mostly mental ones!!) We raised £1,876, again for JDRF. Looking back now, its incredible to think that with everyones support who’s donated or helped at one of the events (or both), we have raised £8,231 towards getting a cure for Samuel! If you’ve donated, or helped set up an event, or sell tickets, or bake cakes, or make meals, or cycled, run or swim with me, or anything else – you are all a huge part of this! Right – enough looking backwards, naval gazing etc. Time to look forward to this year…. “What are you doing this year, Gareth?” I hear you ask… Well, thanks for asking! 2014 is going to be the year of cycling for Yorkshire, as you may or may not have heard, the Tour de France is coming to Yorkshire! For two days to be precise. The whole race starts in Leeds on Saturday 5th July with the finish of Stage 1 that night in Harrogate, before starting in York on Sunday 6th July and ending that night in Sheffield, just round the corner from our office!! You can read more about it on the official website! To commemorate this, I have entered the Tour de Type 1. This is a JDRF organised event where riders are set the challenge of riding the first stage of the Tour de France from Leeds to Harrogate – a hilly 118 miles through the Yorkshire Dales. I’ve never ridden that far in one day! The furthest I’ve ever done in one day is 81 miles. So I’ve got some work to do! The fundraising target to enter this event with the JDRF is £500. Given what I’ve said about about the amounts raised in previous years, I’m hoping to raise a little more than that. I may also have some more to say on other cycling events for this year in the next few weeks, but nothing is confirmed yet, so I’ll keep my powder dry for the minute! In the meantime, the fundraising has begun in earnest. 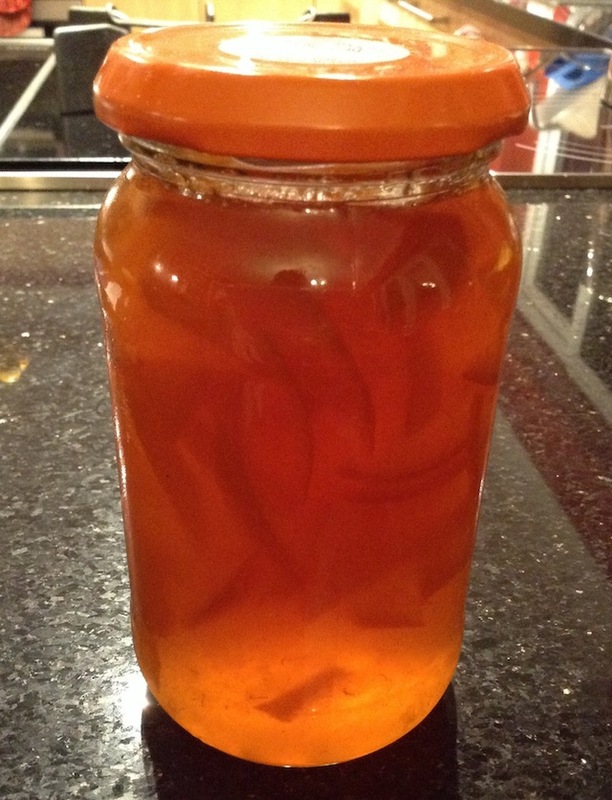 John Marsden, who amongst other things plays the organ in our church, kindly donated a few jars of his very excellent home made marmalade. Nikki put a quick post on Facebook and in no time at all, we’d sold 18 of them. So, thats £45 in the kitty already! Thanks to John and to all those who bought some! Next on the menu – food! 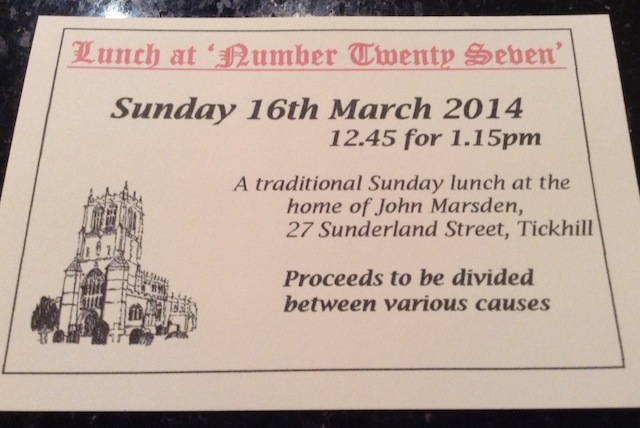 John has very kindly offered to run one of his ‘famous’ Sunday lunch’s, partly in aid of our cause. So, if you are around on Sunday 18th March and fancy a slap up meal, contact Nikki or myself for tickets. £15 per person, half price for children! Next on the list will see a return of CureSam Rocks! The date and venue are to be confirmed, as is the Rock! More news on this soon! previous post: Tour de Type 1 || next post: Going further….